The Amsterdam Dance Event is the biggest dance conference and festival in the world. Everyone from the industry is in town, 80 venues participate and over 2000 artists perform in this one single magical week in October. No wonder it’s our favorite week of the year. ADE can get a little overwhelming though. It’s physically impossible to see all those artists, even if you don’t sleep. To make your dilemma a little less hard we’d like to recommend you to check out the Absolut Nights ADE program on Saturday. When we think of Absolut we think of vodka, obviously. And we like vodka, so we’re more than happy the brand is official vodka sponsor of ADE. But did you know that Absolut collaborated with a lot of interesting contemporary artists and celebrities, both local and international? With Absolut Nights they blew away New York, São Paulo, Berlin and Johannesburg, and now it’s Amsterdam’s turn. 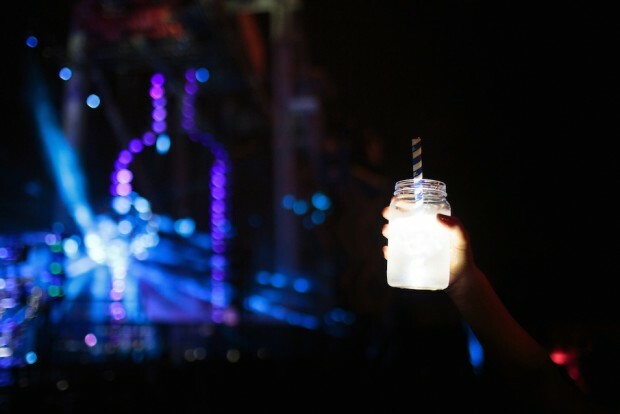 Both Absolut and ADE believe that if brands work together with leading artists they can provide a platform to shape the future of nightlife, and we couldn’t agree more. Absolut will host a day and night program on Saturday October 17. During the day curious creatives will have the opportunity to learn from professionals. One of the workshops is hosted by Werc Collective, which consists of Joachim Rumke, Olav Huizer, Jelle Valk and Joachim de Vries. They started out as just ‘fooling around’ but are doings some serious visual design now for major international festivals such as Lowlands, Awakenings and Dreadmark Finland. They’ll provide some lucky audience members with the chance to live mix visuals to music that’ll be played in the evening. At night Werc collective and DJ Benny Rodrigues will work together for the first time to create an unique visual experiment. Benny doesn’t really need an introduction any more, that guy is everywhere. Naturally he’s a part of ADE as well. They’ll use crowdsourced images to create an epic visual artwork, and to top it off the latest limited edition bottle will be launched. Absolut needs your help to create a crowdsourced visual show! So they’re asking you to add the #AbsolutADE under your favorite Instagram picture that revolves around creativity in nightlife in the broadest sense of the word. Think of unique and iconic environments, people and infamous nightclubs of the past and present. Absolut will choose 25 entries to shape the visual artwork and the most creative entry will win two ADE passe-partout tickets. You can also win a passe-partout by entering here! Before participating please read the terms & conditions.